Little Bit Funky: quilt makin' week three. Ok...so this post may bore you to tears...but I am a visual person, so hang in there. 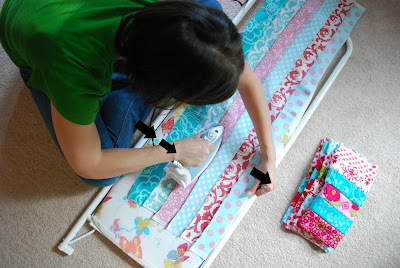 The point of this step is to get your strip sets nice and flat so that they will cut nicely and sew together well...do this by ironing all of your seams down in the same direction. This is how I did it...I held the side furthest from me and pulled slightly as I ironed toward that hand...always in the same direction. 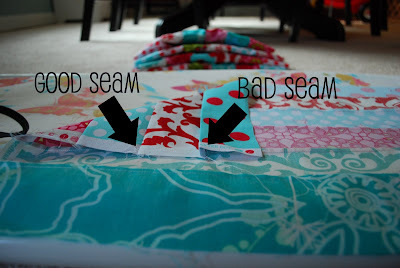 You want to make sure your seams are pulled apart and not folded over...See the arrows above...does that make sense? See...before and after...doesn't have to be perfect but you want it to be as flat as you can make it. Do this with all of your strip sets...next week we will cut again! Love these colors! Your quilt is going to be fabulous!! I also love the colors, where do you get your fabric? Pretty colors... that's going to be so pretty! My mom was a quilter, but I was never interested. I see so many pretty and "hip" quilts these days.. I might need to give it a try. Your quilt is looking so fantastic! I really love how those colors are coming together. I've never tried that combo but I might have to! Do you always iron on the floor? You are killing me with the fabric awesomeness. Are you ironing on the floor??? Or is that a cool arty camera trick? Love the new header. Your kid is scrumptious. For reals. I am so excited by the colors you have chosen. This will be fabulous when it is completed and you too can be snuggling under your own quilt!! your quilt is looking good. love the new header photo and wording. so cute! I am in love... so bright and cheery... like all of your masterpieces! I am a total novice seamstress meaning I can sew a straight line, only. Wondering if I could actually pull this off???? Might try when my kids are back in school next week. Thanks for the inspiration. Wow!! I LOVE the fabric colors you've picked for this quilt! Where did you get the fabric at?? I've looked high and low and can't seem to find it.